Swirrl Blog | Who's using the Internet for social good? Who's using the Internet for social good? 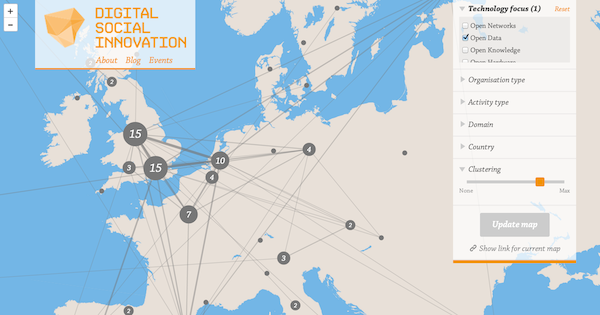 Digital Social Innovation is a project we’ve been working on for Nesta which is all about tracking organisations and activities across Europe using the Internet for social good. You can explore who’s been working on what and with whom via an interactive map, which updates in realtime as more data is added. Any organisation in Europe can sign up to showcase themselves and their activities and, because the projects are linked, you can see at a glance who else is working on them. Each activity has a page describing it and the areas it impacts as well as a lovely map visualisation, showing who’s joining in on it. For example, check out the CitySDK project. 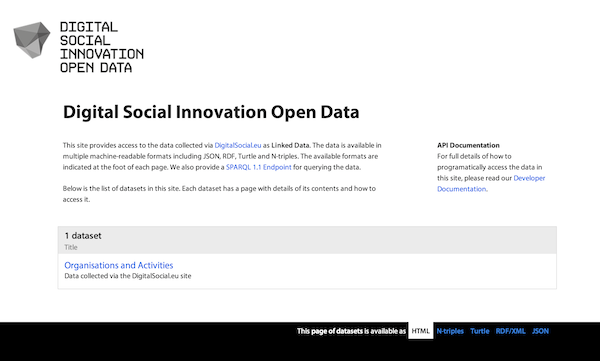 The icing on the cake is that all the data entered via the site is instantly accessible in a Linked Open Data site powered by our PublishMyData platform. So, personal details excepted, anyone and everyone can access anything and everything in there. Personally, this is one of our favourite features of this project; the more that people can access the data, the more it can be used. And getting data used is what we’re all about. Full details of how to access the data programatically via the APIs can be found here. The information collected in the site is being analysed by our collaborators in the project (who include FutureEverything, Esade, IRI and the Waag Society) to help identify the most important trends and influencers in this area, and so provide policy recommendations to the EU, who are funding the project. We’re proud to have worked on this and think it’s an interesting and innovative use of Linked Data. Read out more about the project on its About page and blog.